Check out the latest fashionplate featuring our customized repurposed Pink Floyd vintage tee at Seamore’s in Chelsea. Met the girlies here for a weekday catchup dinner on one of those in between summer days. I love the original Nolita location so was stoked when they opened a location in my hood. It took a while to get a table so we got some wine in the cute downstairs speakeasy. Once we were seated we ordered more wine and split the mac and cheese which was yummy. Then I got the seared fish burrito which was good and came with a great kale salad. One of my friends got the veggie version of this. My last gf got the seared scallops special which looked delish. All in all it was yummy dinner and I’ll be back. Tip make a res or come early. See how I styled this fashionplate below. 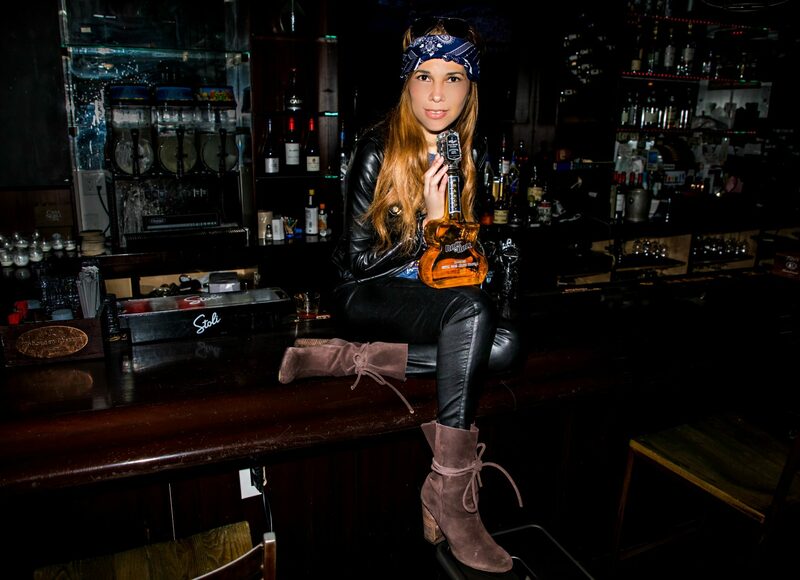 Check out a brunchtime fashionplate featuring our Goldie bodysuit at Pig Bleecker. For a catch up brunch with the bestie we decided to finally check out Pig. I got a Bleecker Southside and a cold brew to drink because you know I’m a trap queen, errr beverage queen. We then decided to splitzies a bunch of things. The pigs in doughnuts weren’t as good as we expected. However everything else was great. The veal meatballs were tender and flavorful with lots of sauce and cheese. The mac and cheese with goldfish was pretty bomb. We also dug the burger and fries. All in all a fatty meal that required a leisurely walk home. See how I styled this fashionplate below. 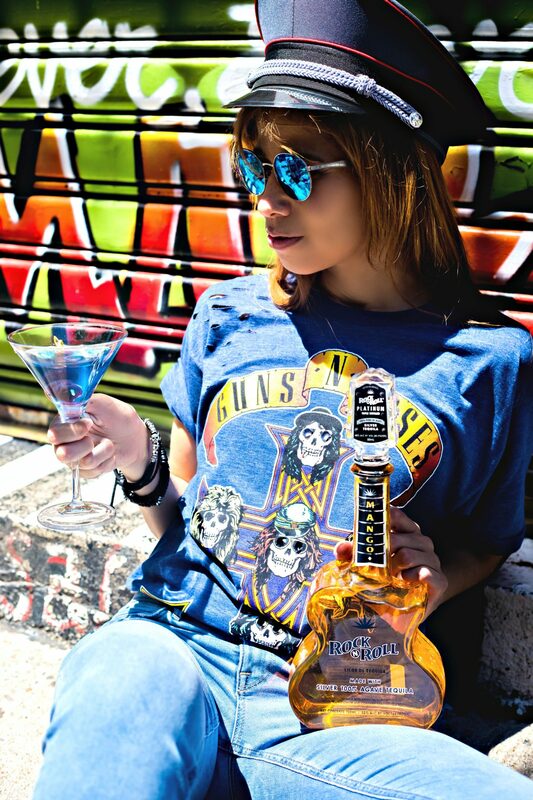 Check out Carla in our customized re purposed Guns N Roses vintage tee and her tasty fun Rock and Roll Tequila Blue rockaritas below and on her blog. 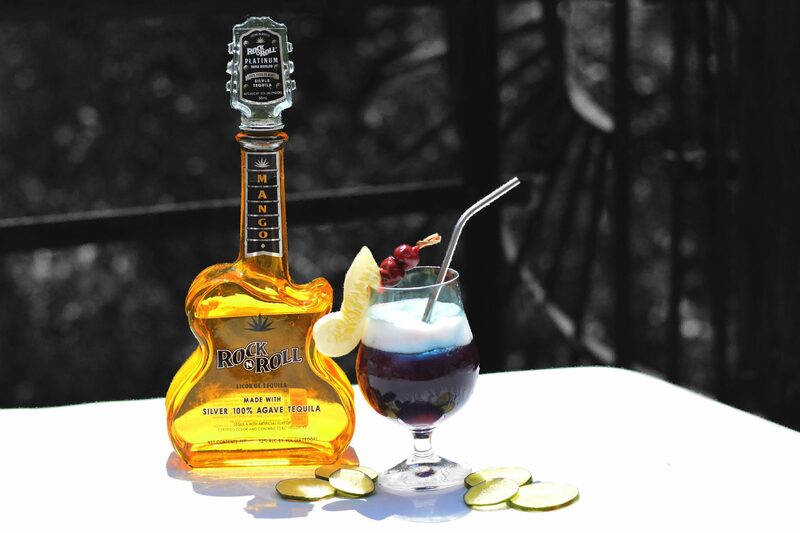 Do You want to find out why the Rock’N’Roll Tequila has to be served loud? You can start by listening to the playlist and clicking the button read more. A few weeks ago I showed you different ways to wear rock and roll shirts around the story of great bands. Today I am mixing some of my Axl Rose’s fashion looks with the Rock and Roll Tequila style. Miss Caipi came out with a refreshing cocktail recipe inspired by the creativity of the brand package and taste. I love the idea to be able to mix three passions of mine: fashion, rock and roll and mixology. I remember when I first received the case of Rock and roll tequila, I was so obsessed by the bottle and case designs; I was thinking to myself that if one day I have my own liquor brand it would be something as creative as this Tequila package. It is an entirely stand out product hitting the market. 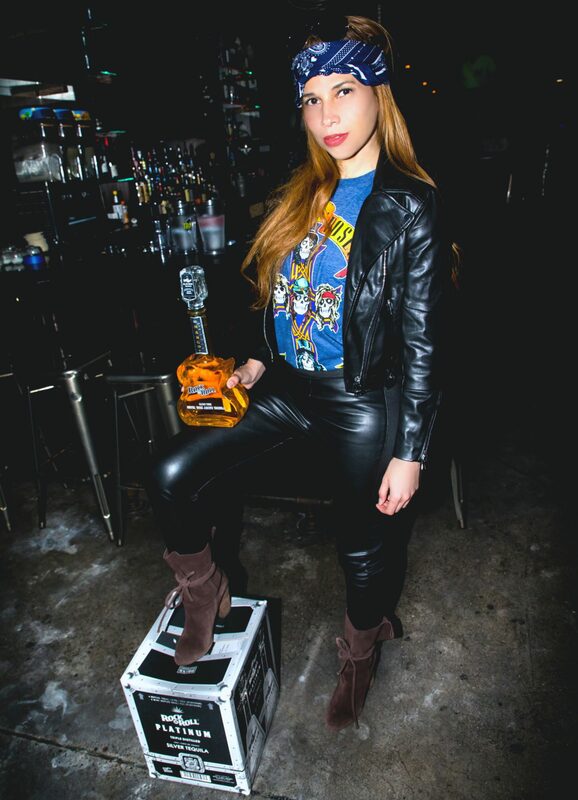 The Rock and roll Tequila is a triple distilled tequila available in select cities going around spreading the word about the brand with their tour “Serve Loud.” By product package and taste I am sure they are getting an enormous amount of attention! Since Margarita is the most popular cocktail in the USA, my mix was originated around something refreshing with a lot of rock vibes around the cocktail. For my recipe, I used The Rock and Roll Tequila Mango which has super natural flavor with no sugar added. I was able to create a balanced margarita mix type including freshly squeezed lime juice, blue curaçao, and the Rock and roll Mango flavor. The Blue Rockerita Caipi rocks and it is super easy to make. Combine all the ingredients in a shaker with ice and shake well. In a glass filled with ice pour the cocktail and if you want you can garnish your blue Rockerita with a pineapple musical note. 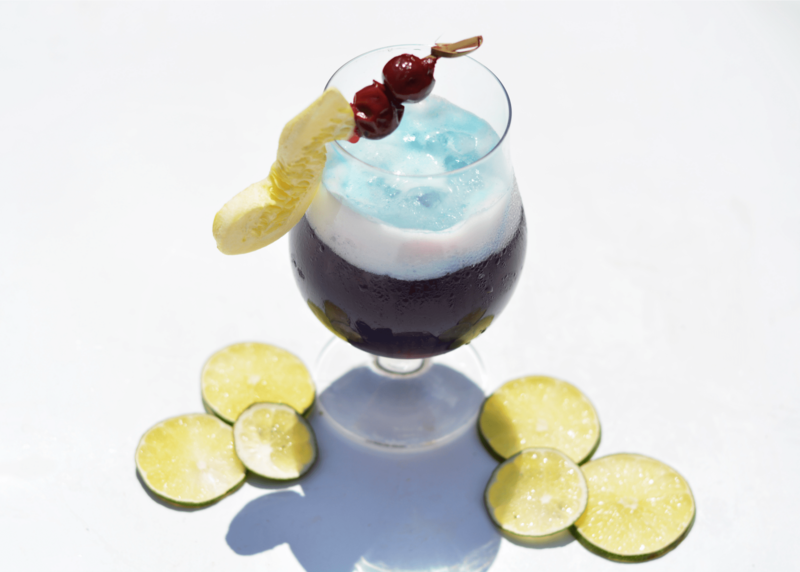 To rock this cocktail to the fullest, You have to serve loud, listen to your best rock music and enjoy your Blue Rockerita Caipi to the best. I am so happy to be able to combine rock fashion and a refreshing cocktail all in the same concept! 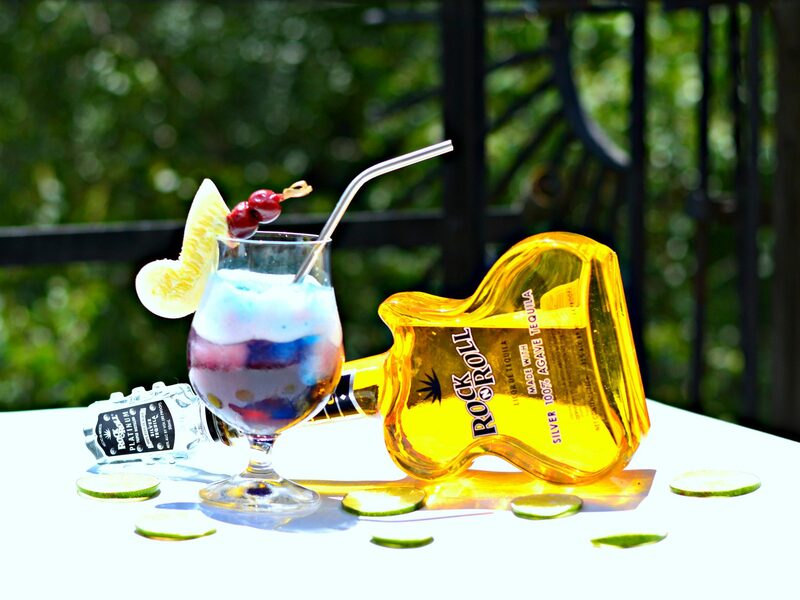 Are You are ready to get some Rock’N’Roll Tequila and start to shake your Blue Rockeritas? It is important you serve loud and invite some friends over to complete the party. Use the comment box below to share your thoughts about the brand and cocktail recipe and the share buttons below to spread the word around.